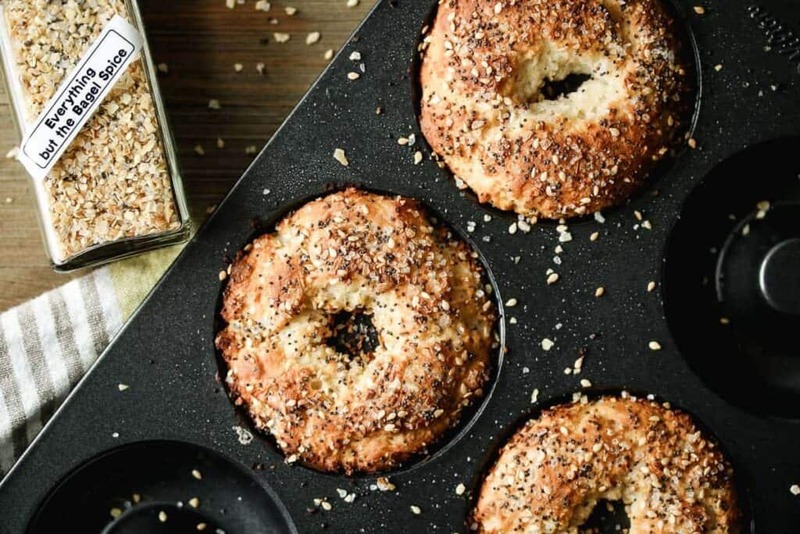 You are here: Home / Recipes / Breakfast / Quick Breads & Muffins / Two Ingredient Bagels – Easy & Gluten Free! Two Ingredient Bagels. That’s right. Two. Ingredient. Bagels. *This post may contain affiliate links. If you click a link, I may earn a small commission from qualifying purchases. Affiliate links are clearly marked and I only link to products I actually use and recommend. Plus I found a new use for my donut pan… further justifying that frivolous purchase! High five! But seriously. This recipe is two ingredients. Two. That’s it. I still can’t believe it really. It’s just Pamela’s Baking and Pancake Mix (affiliate link) and greek yogurt! Well, plus whatever topping you wanted (everything spice, obviously) but I am not going to count that ok? These are so good and literally can't be any easier to make. Literally. Everything Bagel Spice, other desired toppings, or leave plain. Preheat oven to 400°. Grease a 6 cavity donut pan. In a small bowl, mix together the baking mix and greek yogurt with a spoon. 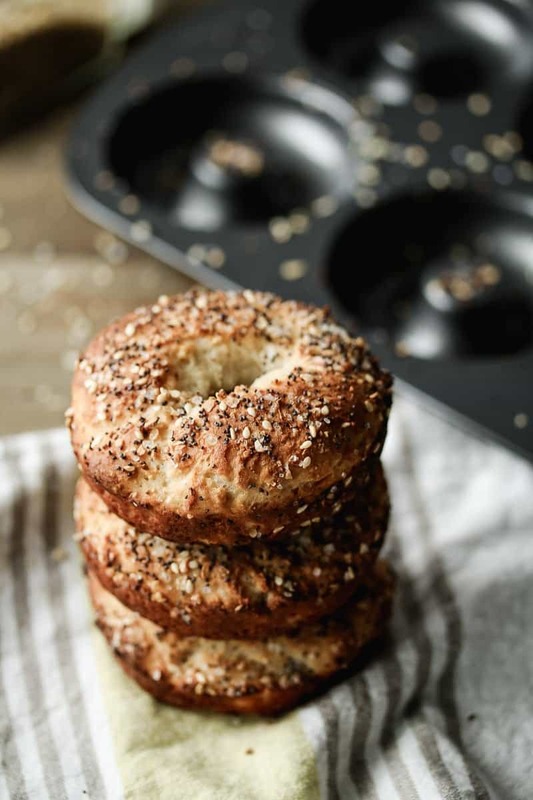 If using Everything Bagel Spice, sprinkle some in the bottom of each donut cavity. Spoon the batter around each well of the donut pan. 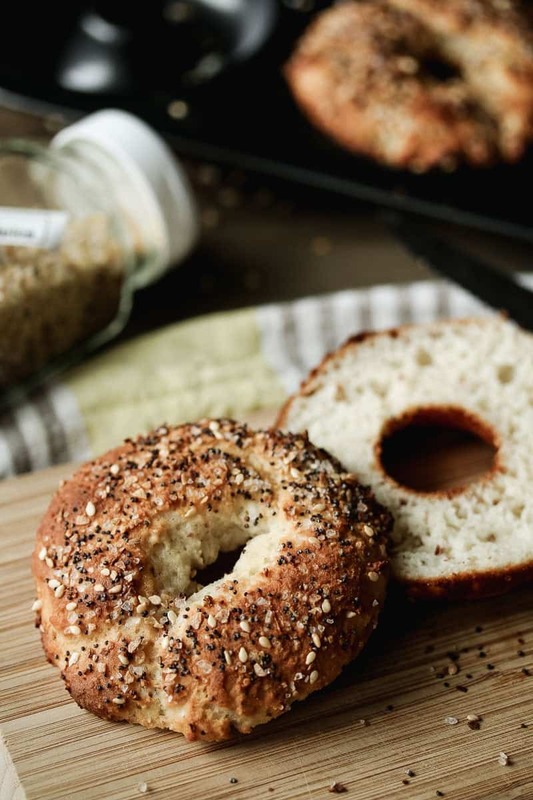 Sprinkle with more Everything Bagel Spice, if using. Bake 17-20 minutes or until dark golden brown. Let cool slightly and then devour! If the greek yogurt is separated a little in the container, that's actually great! Don't mix the whey back in. Just scoop out the thick yogurt. They're really best when fresh, so halve the recipe if you only want a few bagels. You don't have a donut pan? That's ok! Just line a baking sheet with parchment paper. Do your best to roll 1/4th of the dough into a ball. Place on the parchment and flatten a little. Then use your finger to poke and spread out a hole in the center. Sprinkle with seasoning and press it down a little to make sure it sticks. Bake as directed above which will be closer to 20 min than the 17 min. Here’s my recipe for Everything Bagel Spice blend. Or try my favorite smoothie! You can find one on Amazon! Enjoy! I made these, too but never thought to use a donut pan. I am so stealing your idea! THX! And the bagels are great! We are vegan any thoughts on if a dairy free yogurt would work? I haven’t used dairy free yogurt before so I’m not sure how it compares. It needs to be fairly thick. If you are up for the experiment, maybe just do half of the recipe so you’re not wasting too much if it doesn’t work out. Thank you for responding so quickly. If I try it would you like to know the results? Definitely! Good luck & happy baking! What is gluten free baking mix? Baking mix or Pancake mix. I use Pamela’s brand.